to see how they roll & especially to see WHERE. Ashley & Mark left the church [ a BEAUTIFUL church - St. Joseph's in St. Charles ] en route to old Main but made a spontaneous stop. I'm taggin' along, smiling... remembering how great it is to be surrounded by the company of friends & thinking "right on you crazy kids" when in the parking lot, a groomsman caught my eye and said to me "you never know what to expect... this is how we roll." That phrase "this is how we roll" has been in my head ever since. Mark & Ashley had a big wedding party. For all the right reasons. They have Friends. The kind of friends who fly-across-the-country to hang with you. The kind of friends who go way back. High school friends. College friends. Ashley first called me nearly two years ago to book their wedding date. Her sister, whom I'd met as a maid-of-honor at Becky & Justin's [2003?] wedding told me she would. "I know you're what she's looking for" Wendy assured me hours after we met. Wendy rocks. is a quick collection of the more unconventional [ same link as above, am just so proud to be figuring out these codes. ] An afternoon wedding, an evening reception....what's better than spending an hour in your afternoon soaking up wedding memories with the best of friends! BUT that time, that day, it all worked out. That artsy-looking guy was indeed an artist: Justin Farmer, graphic designer. He & Becky were indeed photographer-shopping & decided that day that my alternative-to-the-traditional approach might just be the right fit. Of all the couples whose weddings I've documented, none have had more influence on the growth of my photography-as-business than Becky & Justin. Proof: it was thru Justin & Becky's wedding that I eventually met, not only Ashley Nagel, but also Tracy & Mike [wow! CAN'T WAIT to tell you about Tracy & Mike!!] AND then thru them, Kelly & Jason....and soon I'll be shooting Jessica & Jamey. It's an amazing roots-in-Boonville bunch and it would be hard to imagine a better group of people. OK, but back to Justin & Becky whose maid-of-honor Wendy is Ashley's big sister. WELL...Justin isn't just creative in his presence, he's one of those people who gets a flash of inspiration & seizes it. 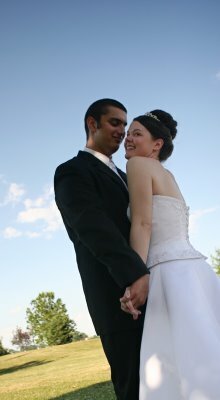 A few days before his 1st wedding anniversary, he called upon a large format print shop his company had worked with in KC. Wanted to make some canvas prints from his BW wedding pictures to hang on the wall & surpise Becky wih. How great is that?! The printer whose service he sought had quite recently become engaged herself. She too was a graphic artist planning a far-beyond-ordinary wedding AND the man she was about to marry designed websites that are second to none [hint: you see his work at www.silverboxphotographers.com). In order to "close it up" [another key Mark Mattes & co. phrase] I'll go straight to the punch: what WONDERFUL [and talented!] people we've met thanks to Becky & Justin Farmer -- not only the Boonville group but every single day Kim & I are GRATEFUL for the work and talents of Jen & Dan Eckart. It's feasible to say that without Jusin & Becky, SilverBox Photographers would have been little more than a concept conversation that never made it off the drawing board. Justin & Becky, if you're out there, thank you, THANK YOU! You provided moments-a-plenty, many-a-connection to folks we now consider friends AND most of all, momentum. P.S. Mark & Ashley, loved your celebation, LOVED your friends, but your USHERS...they totally rock.